INFICON, one of the world's leading suppliers of leak-detection equipment for the auto industry, will demonstrate robotic leak-detection methods at The Assembly Show (Oct. 23-25) in Rosemont this year. "Known problem areas such as high-pressure fuel-line connections on GDI (gasoline direct injection) engines, electric-vehicle batteries and air-conditioning systems can be tested with a high level of confidence with robotic systems. Leak testing is the key to achieving quality throughout the production process." Parker notes that there are two types of robotic leak-detection methods - stationary and dynamic. Stationary testing employs a robotic arm equipped with a "sniffer" probe that moves to pre-selected points on the test part, then remains stationary for a defined period of time. "Dwell" times are based on potential leak rates at each point. 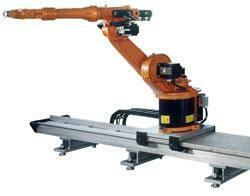 For dynamic tests a robotic arm moves a "sniffer" probe in a continuous path along a test part's surface. The accuracy of a dynamic test is based on the distance maintained between the part and the sniffer probe, the speed at which the robotic arm travels, and how much air and test gas the leak detector is able to "sniff." Dynamic tests can quickly check relatively large component areas, while maintaining permissible cycle times. Parker points out that commonly used leak-detection methods are simply unsuitable for today's new generation of electric vehicle batteries. Best practice calls for the use of modern integral-test-gas testing which is both fast and accurate. INFICON has developed a new leak-detection system on display at The Assembly Show that is capable of locating extremely small EV battery leaks at much faster rates than conventional systems. The company's new XL3000flex is designed to "sniff" small leaks up to 20 times faster than most current systems. The XL3000flex can detect leaks at sample flows of 300 up to 3,000 sccm (standard cubic centimeters per minute), making it ideal for robotic sniffing. Most conventional sniffers only are capable of sniffing at 60-150 sccm - much too slow to meet typical production cycle-time requirements. At a leak rate of 1 x 10-3 mbar l/s, the XL3000flex also can detect a leak with 100-percent reliability at a sniffer-probe speed of up to 14 cm/s (5.5-in.). Above that speed, detection probability slowly decreases. INFICON will be located in Booth #245 at The Assembly Show at the Donald P. Stephens Convention Center in Rosemont. Parker adds that INFICON has published a new white paper on the importance of leak testing electric-vehicle battery systems. It's available at: www.inficon.com/en/markets/automotive/e-mobility-white-paper/. He predicts that robotic testing for battery systems will become increasingly important as electric vehicles gain in popularity. More than one million battery-powered vehicles and plug-in hybrid models are expected to hit the road in 2018. And by 2024 that number is expected to increase by 400 percent or more. INFICON is one of the world's leading developers, producers and suppliers of instruments and devices for leak detection in air conditioning, refrigeration and automotive manufacturing. The company has manufacturing facilities in Europe, China and the United States, as well as sales and service offices throughout the world. More information about INFICON automotive technology is available online at www.inficonautomotive.com.